…In this morning's article, it is claimed that the cardinals reported that various lobbies within the Holy See were consistently breaking the sixth and seventh commandments, namely "thou shalt not steal" and "thou shalt not commit adultery". La Repubblica claims the cardinals' 300 page report speaks of "Impropriam Influentiam" on the part of various lobbies, some of them of a "worldly nature", reflecting an "outside influence". 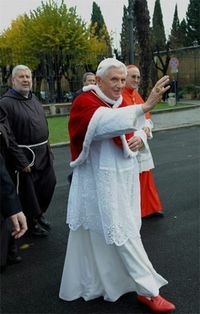 The Rome daily recalls the figure of papal gentleman, Angelo Balducci, accused three years ago of being a member of a gay ring active within the Vatican and involving choristers and seminarians. Do you think the Vatican's gay lobby was responsible for this?